Weekend stay-cations are now tailored to guests’ needs and schedules at The Ritz-Carlton, Millenia Singapore with check-in times that guests can personally choose. With Time to Getaway, guests enjoy $20 off their package rate every hour after 2pm that they opt to check-in, up to a maximum limit of $80 off i.e. Time to Getaway is available from Fridays to Mondays from 1 to 31 January and 1 to 31 March. In addition, guests will enjoy an in-room breakfast for two and $50 hotel credit which can be used for dining, at the retail shop and spa. Well-positioned along Singapore’s Marina Bay, this newly-renovated 608-room luxury hotel continues to be the city’s foremost hotel with award-winning hospitality synonymous with the Ritz-Carlton brand and breathtaking views. The hotel is located minutes away from attractions such as the ArtScience Museum, Integrated Resorts, Esplanade-Theatres on the Bay and the Singapore Flyer whilst two shopping malls are accessible via covered skybridge with over 2,000 shopping and dining options. With restaurants and food and beverage options voted by readers of Travel and Leisure as “The Best in Singapore”, The Ritz-Carlton, Millenia Singapore is set amidst seven acres of tropical landscape. 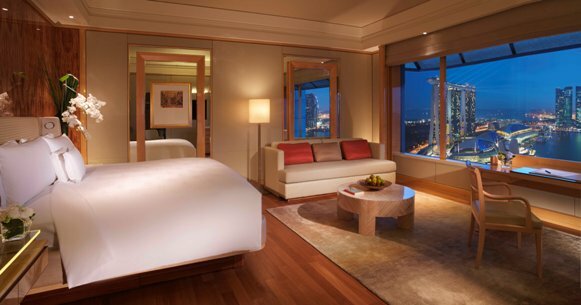 All guest rooms and bathrooms offer views of either Marina Bay or the city skyline. Services and facilities include restaurants and a lounge serving Chinese, Western and international favourites; a Fitness Centre with swimming pool, indoor gym and treatment rooms; and a business centre.